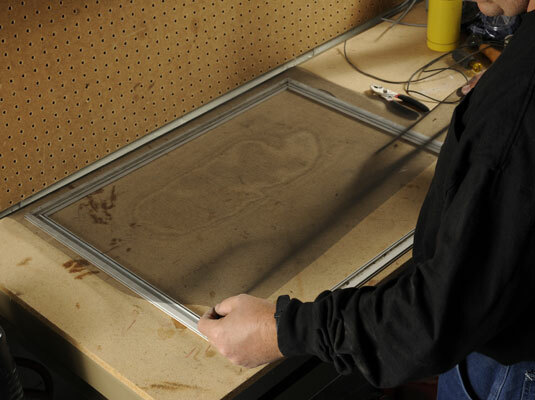 Remove the frame and lay it flat on a work surface. 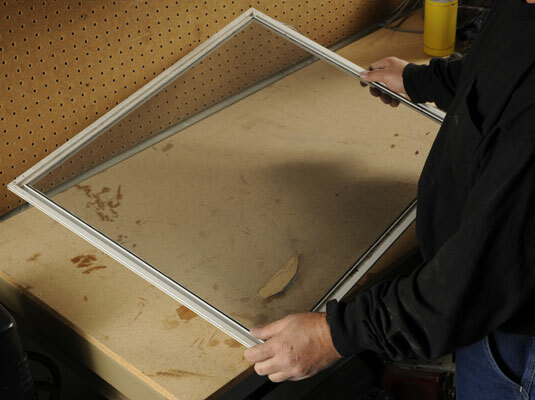 Remove the screen in its frame from the door and lay it flat on a workbench or a set of sawhorses. Pry the spline out of the groove on the back of the frame. Use small pliers or a carpenter’s awl to pry the spline out of the groove. If the corners are tight, use a screwdriver to remove the spline. 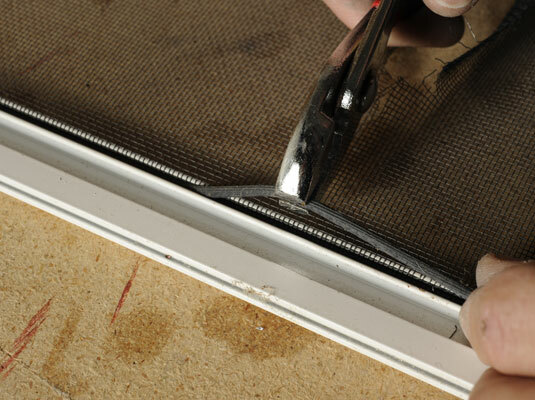 If the spline appears to be in good shape, set it aside for use with the new screen. If the spline is brittle or cracked, you must replace it with a new spline (available at hardware stores). Lift out the damaged screen. 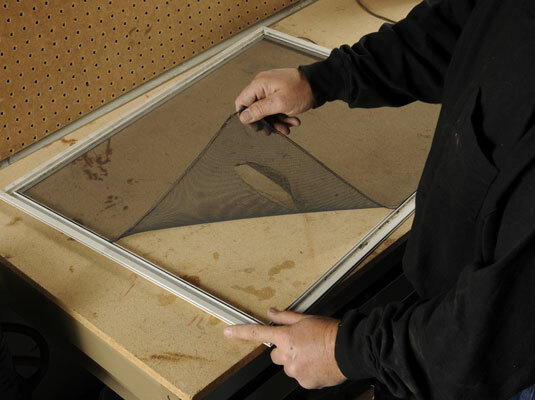 Holey screens let in insects — and bats, if the hole is big enough. Be sure that you remove even the tiniest grit. You can use the tip of a screwdriver or awl to get into the groove if necessary. 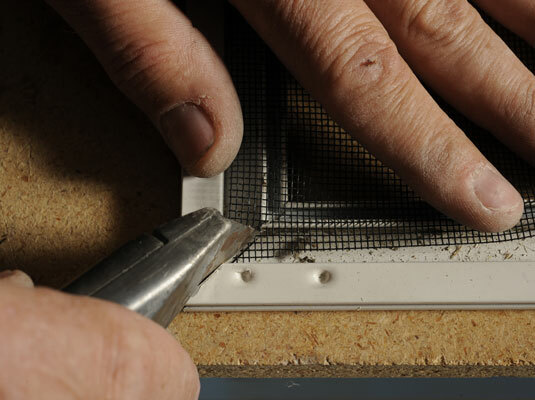 Lay the new fiberglass screen over the frame. 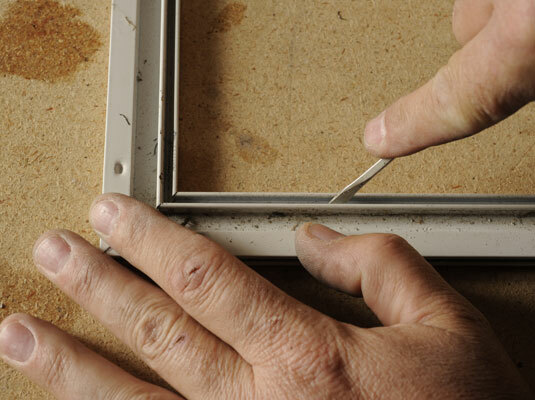 Be sure that it overlaps the groove by at least 1/2 inch on all four sides. Cut the screen at a 45-degree angle at the corners. Cut off the corners of the screen at a 45-degree angle, just inside the outer edge of the spline groove. Press the screen and the spline into the groove using the concave end of the splining roller. Hold the roller at a 45-degree angle toward the inside edge of the groove and then roll downward to press the screen into the groove. Roll the first two sides in place and then insert the top and bottom sides. 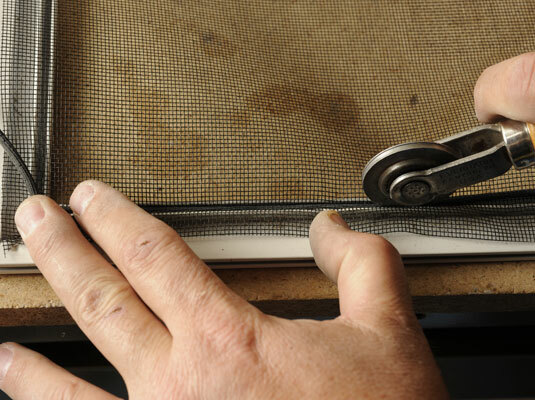 Hold the screen taut across the frame as you roll it into place. Sags and wrinkles are about as attractive on screen doors as they are on people. 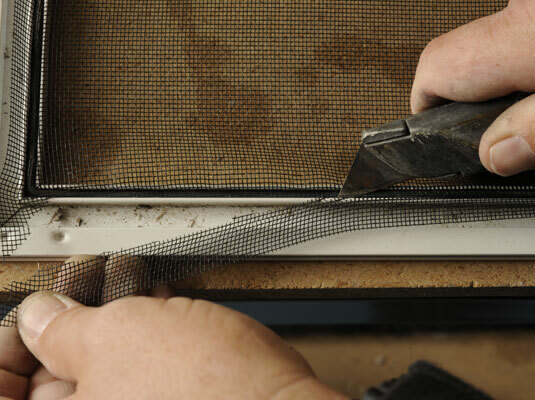 Trim away any excess screen. Place the tip of the knife between the spline and the outside edge of the spline groove and pull the knife slowly along the entire groove perimeter.